The Badjao team celebrates reaching the summit of Mt. Kilimanjaro. Summit day started with a 1 a.m. wakeup call, a quick bite and final equipment check before setting out into a dark and freezing night. A line of climbers’ headlamps showed the way up a steep trail of seemingly endless switchbacks, an inspiring and daunting sight. We departed from Barafu Camp, a stark, rocky refuge at 16,000 feet, some 1,500 feet higher than any point in California. Above us towered the 19,341-foot summit of Mt. Kilimanjaro, much higher than any of us had ever been. As we climbed slowly, we passed many others ailing in the thin air and moving still more sluggishly. Some stopped, vomited and then retreated. Kili’s glaciers came into view, faintly illuminated by the moon. We could not even see Uhuru Peak, the summit. Biting cold and symptoms of altitude sickness had the four of us on edge. I wasn’t sure we were up to this but knew we’d soon find out. It took five days of high altitude hiking, months of planning and years of physical preparation to get this far. My brother Dan Johanson and I, both Castro Valley natives, have long enjoyed similar pursuits like hiking the John Muir Trail, scaling Mt. Whitney and rock climbing in the Sierra Nevada. To outdoors types, the chance to climb one of the world’s great mountains excites the imagination. But actually climbing it is quite a bit harder than making a weekend trip to Yosemite because of the distance, expense and time required to get there and return, not to mention the physical challenge posed by the highest mountain in Africa. Years passed by before we seriously turned our attention to it. Finally in our 40s and not getting younger, we tried harder to make it happen. A lucky break gave us a lift when we met Wilfred Moshi, one of Tanzania’s leading climbers and guides, who agreed to help us. Then Dan had the idea to use the climb to promote a charity he founded to help poor Filipino children, Badjao Bridge (badjaobridge.org), a main focus of his time and energy since 2009. “Sea-dwellers, experiencing dire poverty are little known or forgotten by society. Climbing Mt. 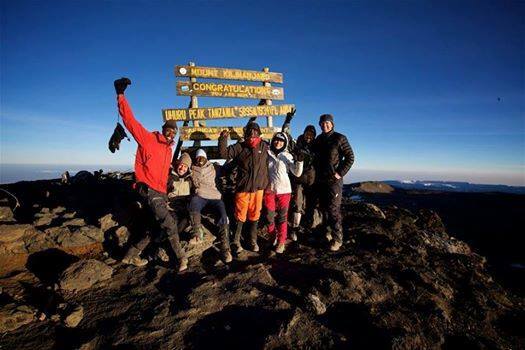 Kilimanjaro seemed like the perfect way bring some attention to our cause,” said Dan. So we chose a date, booked airfare, and enlisted two friends to round out the team: Kat Lam of San Leandro and Ronnie Mosley of Fort Worth, Texas. For several months, we tried to work out more frequently in preparation, sometimes actually succeeding. Ready or not, we started the climb on July 20. A ranger with a machine gun met us at the gate to make sure we paid the park fees, around $1,000 each; Tanzania makes a fortune from its popular mountain. The first leg of our 41-mile journey was a hike through a lush and green rainforest, gaining 3,000 feet of elevation. On the way we met our crew: two guides, a cook, a waiter and 14 porters who carried the majority of our gear. They built camp and made us dinner that night, which we ate in a dining tent using a table and chairs they brought. The porters even set up our tents and inflated our mattresses. All of this is unheard of on a typical Sierra Nevada adventure; our kitchen “furniture” usually consists of rocks, for instance. Wilfred dined with us and briefed us about the following day’s hike, gaining 3,000 more feet to 11,000. In the morning, our waiter delivered coffee to our tents before serving a big breakfast. That set the pattern for the next four days as we approached the mountain. On one hand, we were more supported and even pampered than on any outdoors trip we’d ever taken. But on the other hand, we were challenged by elevation gains none of us had ever attempted. Along the way, Tanzania amazed us. The scenery of the Lemosho route surpassed our expectations as we moved from rainforest to high desert into the summit zone. Monkeys, white-necked ravens and giant groundsel trees were particularly memorable. Even more impressive were the people. Porters carried heavy loads from camp to camp on their backs and heads, sometimes without even using their hands. Most were in their 20s and 30s, working to support their families. While our guides spoke perfect English, the porters did not. Yet that didn’t stop us from interacting and becoming friends with these happy, cheerful souls. Even those from other companies greeted us kindly on the trails. One time Dan tried on a porter’s pack and balanced another bag on his head as locals often do, pacing around and flexing his muscles. The porters cracked up. We felt even cooler than that as we climbed steadily higher, spending three nights at 13,000 feet or higher where the nighttime temperatures fell well below freezing. Every stitch of clothing we brought was needed for the summit attempt. I wore four layers heavy on wool and polypropylene to hold off the icy air. Leaving at 2 a.m., at least we didn’t need sunscreen for a few hours. “Polee polee” is the mountain’s mantra, meaning “slowly, slowly.” We didn’t hurry but made steady progress, stopping a few minutes every hour to catch our breath and refuel. Our water bottles partially froze. Hands and feet went numb. An incredible blood-red sunrise greeted us at dawn on Stella Point. From here, about 450 feet of climbing remained which took 30 minutes. We stood atop Uhuru Peak at 7 a.m., exhausted but exhilarated. Dan and I have climbed many mountains together but this was the first that benefited a group other than ourselves. Thanks to more than 100 generous sponsors, the climb raised more than $12,000 for Badjao children. That just left 13,000 feet of descent, which any climber will tell you is no picnic. We pounded our weary bones back down towards civilization. Our incredible crew bailed us out yet again, building camp so we could rest around noon before tearing it down, hauling our gear several more hours and setting up again. Before we parted ways the next morning, the guides, porters and others sang us a congratulatory song, “Jambo Bwana,” praising us and our accomplishment. That felt great but the truth is we could never have done it without them. We thanked them with a heartfelt “asante sana,” hugs and generous tips. Climbing Mt. Kilimanjaro was an amazing adventure, but helping Badjao children and making new friends made the experience “cool as a banana in the fridge,” as the Tanzanians would say.